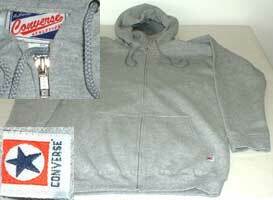 Converse licensed out the manufacture of sweatshirts to the A4 (Authentic American Athletic Apparel) division of the Moshay Corporation in Vernon, California until 2002. The last sweatshirt issue was a Converse Basics line, a few of which are still available. 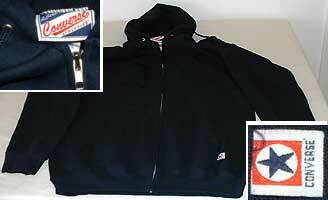 These are hooded sweatshirts with a front zipper and Converse tag on the side. 150 Models of Sweatshirts. Shop 100 Converse Products. Visit FinishLine.com Now and Shop the Deals of the Week! Over 2400 Sweatshirts and Hoodies. Shop 398 Converse Products. From Head To Toe - Shop Casual at Eastbay.com! Under Shop By Department, select Clothing then Hoodies/Sweatshirts. This will get you access to more choices by brand, gender/age, sport, league, price, color, or product rating. Save more with Famous Footwear Rewards. Join now!